Despite severe criticism, the EU rules on state aid have been adopted in the EEA Agreement, stipulated in the association agreements between the European Union (EU) and the countries of Central and Eastern Europe, and incorporated into the WTO Agreement on subsidies and equalization measures. As a result, international law practitioners must have a firm grasp on matters of state aid. This book surveys the rules and regulations relating to state aid in the EU and their role in the EU's overall competition policy. It examines the provisions and implications of Articles 92 and 93 and covers both the substantive law and the procedural questions. 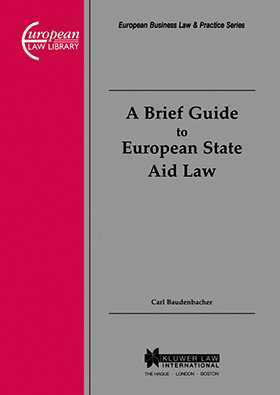 This comprehensive guide is a particularly useful introduction for practitioners and academics who may have limited experience in dealing with matters of state aid.